"Hill family and Vidal family fonds"
264 records – page 1 of 6. Fonds consists of two series: (1). 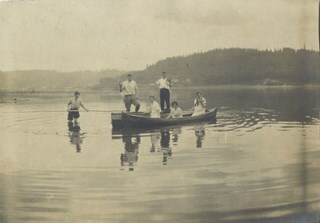 Photographs from a photographic album holding two hundred fifty-three photographs, separated into the Vidal family and the Hill family, and copy negative transparencies; (2). Textual records which include handwritten family trees, typed and handwritten biographical information of the Jones, Wright, Hyde, Vidal, and Hill families, copies of photographic prints, published works by J. H. Vidal and William Cowper, newspaper clippings, and a New Testament. 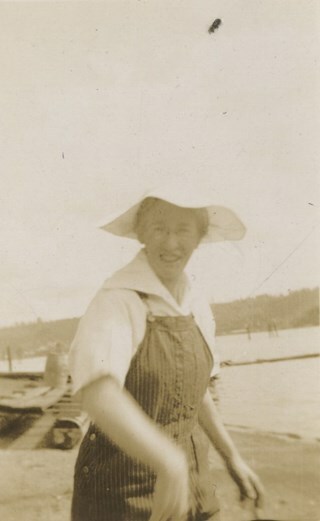 Minard Gerald “Gerry” Hill was born in Burnaby on July 31, 1893 to Marian (nee Berkeley) and Bernard Richard Hill. Marian was born in London, England. Bernard Hill, born in Bengal, India in 1858 to Sir Richard Hill and Jane Ann (nee Rollinson) where his father worked for the East Indian Railway, was one of the early inhabitants of Burnaby. 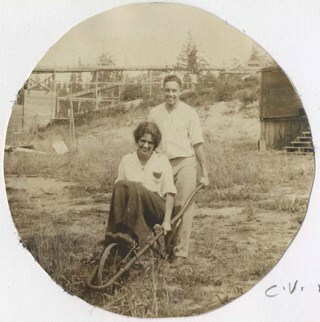 Despite their year s of training as engineers, Bernard, along with his brother, Louis Claude Hill became strawberry farmers and owned all the land between Burnaby Lake and Deer Lake where Deer Creek runs, and half way around Deer Lake. Bernard built his family home at Douglas Road near Deer Lake in 1892. After the decline in the strawberry industry, Bernard worked as a surveyor for the municipality. Bernard also served as a Burnaby trustee and as councilor of Burnaby in 1904, 1905, 1906, and 1909. 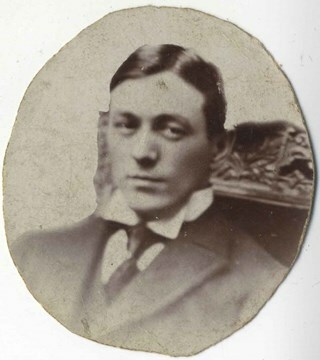 His brother, Louis was one of the first members elected to the Burnaby council and served in 1892, 1893, 1894, and 1910. Louis, born in 1860, married Annie Sarah Kendrick (born in 1896). Together they had one child, Katherine “Kitty” Maude. Kitty, born in 1898, later married William “Bob” John Peers in 1925. 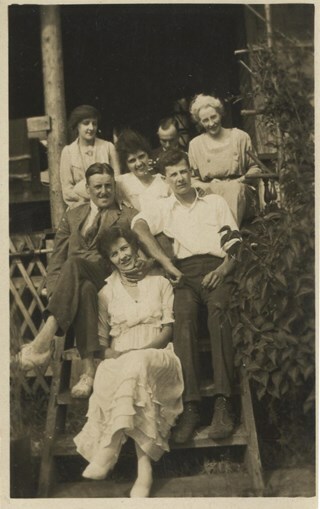 Bernard and Marian had four children: A. Claude (born in England around 1885, married Marion “Mamie”), Frank L., Winnifred “Winnie” L., and Gerry. Gerry attended Miss Harriet Woodward’s kindergarten class, and went on to Edmonds School with Miss Ellen Lister as his teacher. He later went to Central high school in New Westminster, often on horseback. Gerry served in World War I, signing his recruitment papers on November 9, 1914. When he returned home, he worked felling trees, then as an apprentice surveyor and finally as a carpenter. His father, Bernard died in Burnaby on March 27, 1939 at the age of eighty. Charlotte Elizabeth Vidal was born in 1897 in the United States to Louisa Sophia (nee Jones) and Herbert P. Vidal. Louisa Vidal (1871-1943) was a descendent of Jones of Exeter of England and the House of Llanio Cardigan of Wales. Herbert Vidal (1868-1934)’s father was Alexander Vidal (1819-1906). 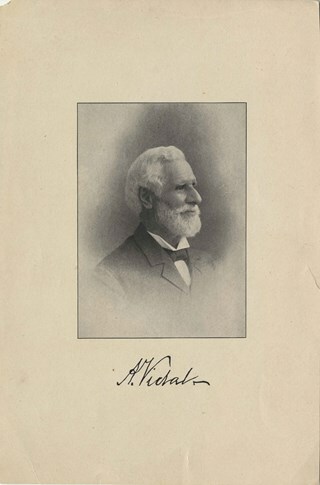 Alexander Vidal, born in Brocknell, England, immigrated to Upper Canada in 1835 and later served as a senator of Canada from 1873 to 1906. He married Catherine Louisa Wright, the daughter of Capt. William Elliot Wright. Both of Charlotte’s parents, Louisa and Herbert, were born in Ontario. Charlotte Vidal was sister to Dorothy Kate and Alexander E. E. Vidal. Minard G. Hill (aged 27) and Charlotte E. Vidal (aged 23) married on September 28, 1920 in Vancouver. Gerry built a house for him and his wife about a thousand feet from his parents’ home. He also bought property at Yellow Point on Vancouver Island around this time. 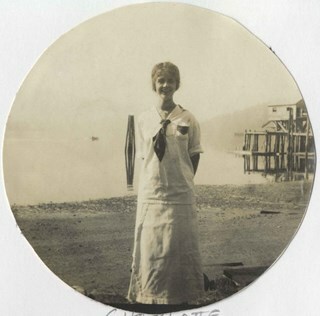 By the early 1930s Gerry had moved to Yellow Point permanently and begun building the Yellow Point Lodge. Gerry and Charlotte bore three children: David, Lesley C. (born in 1929) and Gerald. 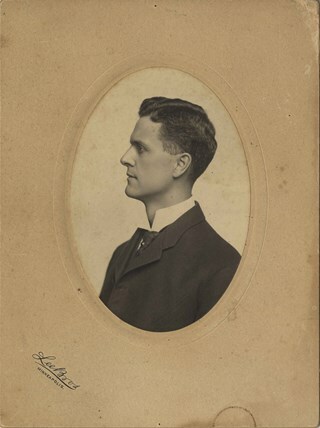 Gerry was later remarried to Elizabeth (nee Holen) and had one child: Richard Grant McEwan Hill born in Ladysmith. Lesley married M. Clarke and had two boys: Roy and Graham. She later married B. Durban and had four boys: Patrick, Michael, Gary, and Grant. Charlotte died February 11, 1984 at the age of eighty-seven. Gerry died January 30, 1988 in Ladysmith at the age of ninety-three. 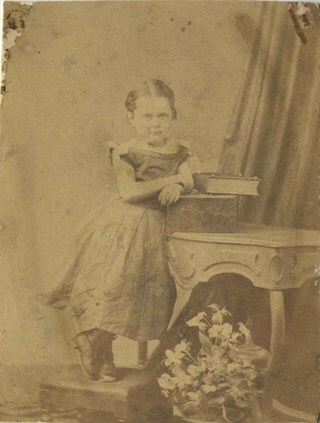 Photograph is a portrait of an unidentified girl. Hill, Alice Maude Huggett "Maude"
Note in pencil on album page reads: "Maude?" Photograph is a portrait of an unidentified woman. Note in pencil on album page reads: "Unknown"
Photograph is a portrait of an unidentified man. Photograph is a portrait of Charlotte Vidal. 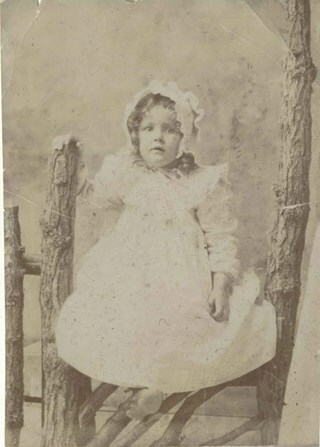 Photograph is a portrait of a girl identified as Charlotte Vidal. Photograph is a portrait of a woman identified as Charlotte Vidal. 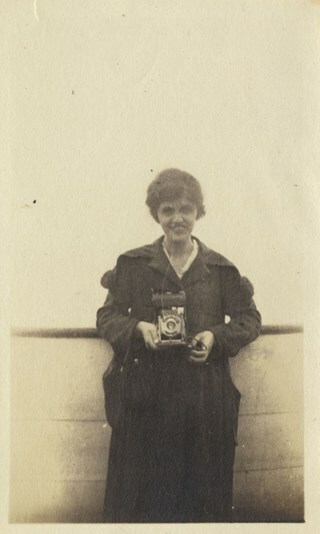 Photograph is a portrait of a woman identified as Charlotte Vidal, holding a camera. 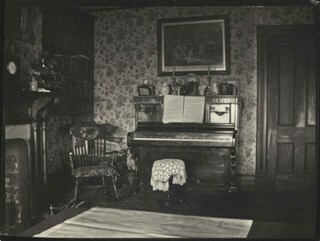 Photograph shows the interior of a home, including wallpapered walls, newspapers, and a piano. 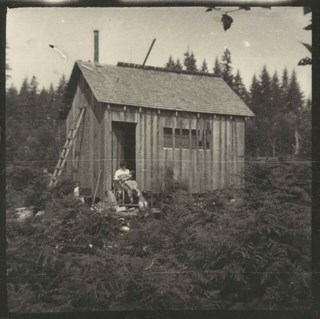 Photograph shows a woman sitting in front of a wood shed and holding a baby. 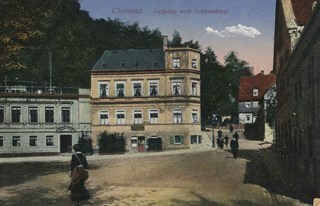 Photographic postcard shows buildings in Chemnitz, Germany. 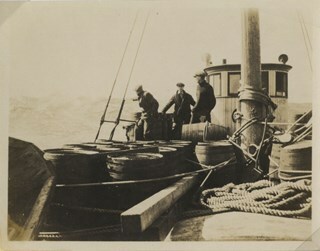 Top of recto reads: "Chemnitz / Anfgang zum Schlossberg"
Recto reads: "Chemnitz - Kuchwaldschanke"
Photograph shows three unidentified men on a boat. Photograph shows a boat in the water. 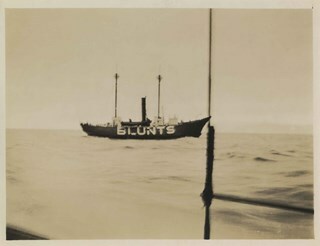 The boat reads: "BLUNTS"
Photograph shows a man near the top of the mast of a boat. 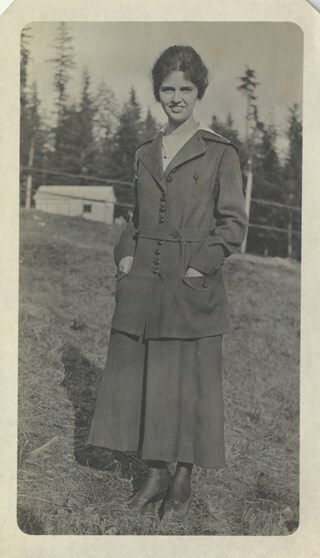 Photograph is a portrait of an unidentified woman wearing a hat and coveralls. 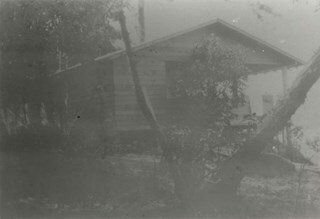 Photograph shows cottages, one possibly belonging to Louisa Vidal, in the woods. 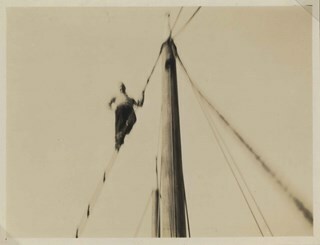 Series consists of a photographic album holding two hundred fifty-three photographs and twenty-seven slides compiled by the Hill family and the Vidal family. 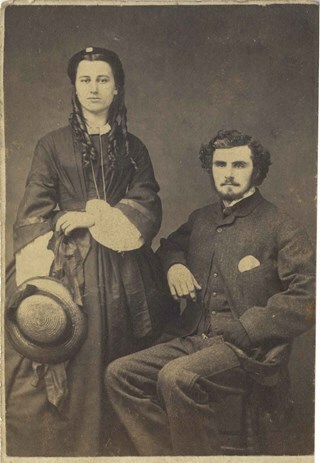 Photograph is a portrait of a man and woman holding hands identified as "Miss Marion Moore" and "Mr. B. R. Hill". Note in black ink on recto reads: "Miss Marion Moore / Mr B. R. Hill". Photograph is a portrait of two unidentified men, three unidentified women, and a man identified as "Mr. B. R. Hill". Note in pencil on verso reads: "Bernard R Hill"
Photograph is a portrait of a man identified as Alexander Vidal. Note printed on recto reads: "A. Vidal"
Note in pencil on verso reads: "Alexander Vidal / About 1900 / Great Grandfather of L. L. Vida[l]"
Photograph is a portrait of a man identified as Herbert Penrose Vidal. 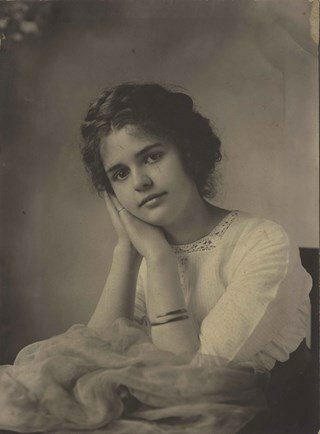 Note in black pen on verso reads: "June 1904"
Embossed photograph stamp on carbodard reads: "Lee Bros / Minneapolis"
Note in pencil on album page reads: "Herbert Penrose Vidal / June 1904"
Photograph is a portrait of a young woman identified as Julia "Jue" Jones Owens. Note in pencil on the verso reads: "Gr. Aunt Jue"
Note in pencil on album page reads: "Aunt 'Jue' (Julia) / B. 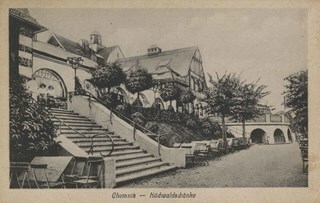 1873 . M. William G. Owens"
Note in black pen on verso reads: "To Uncle George / With Julia's Love"
Note in pencil on album page reads: " 'To Uncle George (Jones) / With Julia's Love' "
Photograph is a portrait of three unidentified women. Photograph stamp on verso reads: "John Barron / Photographer / Sarnia, = Ont." 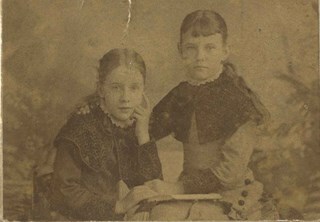 Photograph is a portrait of two unidentified girls, one perhaps being Blanche Wilkinson. Note in pencil on album page reads: "? and Blanche W.?" 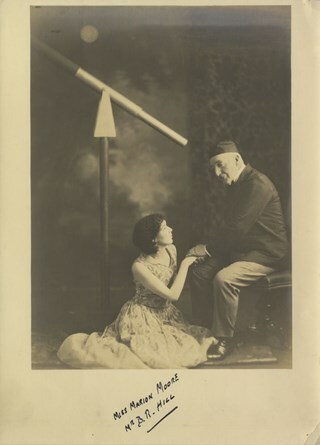 Photograph stamp on verso reads: "Barron & Walker / Artist and Photographer / B & W"
Photograph is a portrait of Rebecca Hyde Jones and Edward Albert Jones. 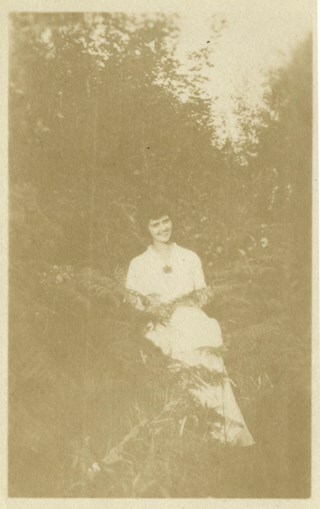 Note in pencil on album page under the next photograph reads: "Rebecca Hyde / (with Edward"
Photograph is a portrait of Maude. Note in pencil on album page reads: "Maude ?" 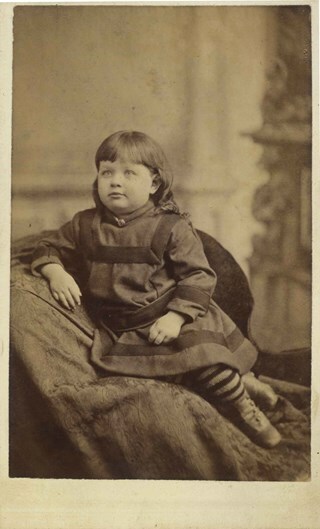 Note in blue ink on verso reads: "Maude"
Photograph stamp on verso reads: "J. Foster Elliott, / Photographer, / Sarnia. / Negatives Preserved"
Photograph is a portrait of Blanche Wilkinson. Note in pencil on album page reads: "Blanche Wilkinson / 1890's"
Note in pencil on verso reads: "Blanche Wilkinson / b. late 1890's"
Photograph stamp on verso reads: "John Barron, / Photographer, / Sarnia." 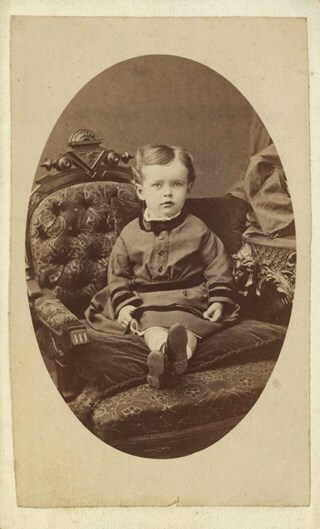 Photograph is a portrait of a boy identified as Guy. 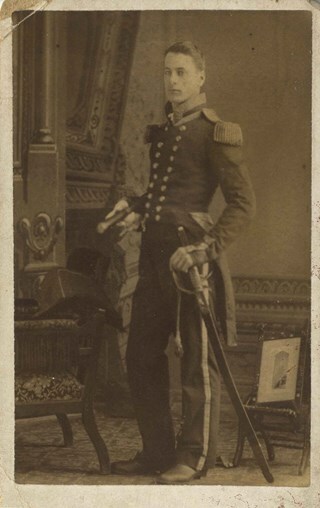 Note in pencil on album page photograph reads: "Guy ?" Note in blue pen on verso reads: "Guy"
Photograph stamp on verso reads: "J. Foster Elliot / Photographer, / Sarnia. / Negatives Preserved"
Photograph is a portrait of man identified as Herbert Penrose Vidal. Note in pencil on album page reads: "Herbert Penrose Vidal / 1866-1934"
Note in black pen on verso reads: "H P Vidal"
Photograph stamp on verso reads: "Barron & Walker / Artists and Photographers / Sarnia / Ont"
Photograph is a portrait of woman identified as Louisa Sophia "Lou" Jones Vidal. 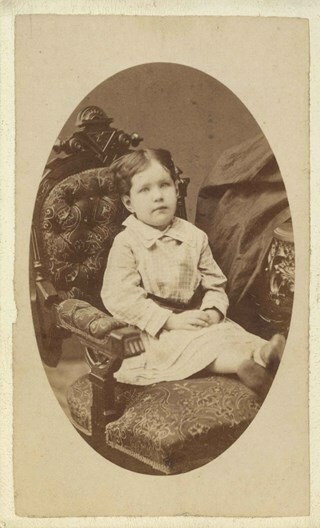 Note in pencil on album page reads: "Louisa Sophia Jones"
Note in pencil on verso reads: "Aunt Let? / Louisa (?)" 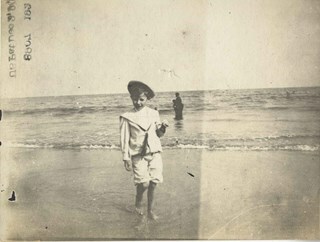 Photograph shows a boy identified as Alexander E. E. "Bill" Vidal standing on a beach. Vidal, Alexander E. E. "Bill"
Note in pencil on album page photograph reads: "Alexander Vidal"
Note in black pen on verso reads: "Uncle Bill"
Note in blue pen on verso reads: "Mom"
Photograph stamp on verso reads "... 91"
Photograph is a portrait of Dorothy Vidal holding Dorothea Hyatt. 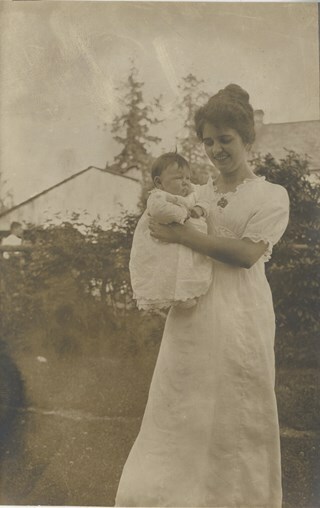 Note in pencil on album page reads: "Dorothy Vidal"
Note in pencil on verso reads: "Dorothy with baby Dorothea Hyatt"
Photograph is a portrait of Charlotte Vidal holding Dorothea Hyatt. 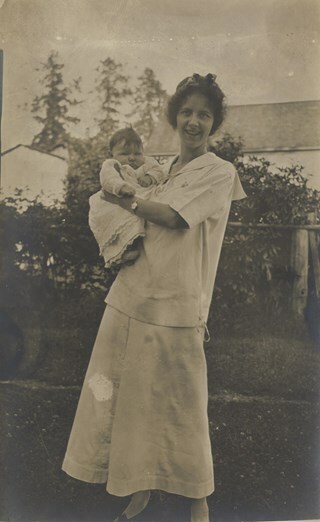 Note in pencil on album page reads: "Charlotte Vidal / (Baby Dorothea Hyatt)"
Note in pencil on verso reads: "Charlotte with baby Dorothea Hyatt"
Photograph is a portrait of Charlotte and Dorothy Vidal and six other women. 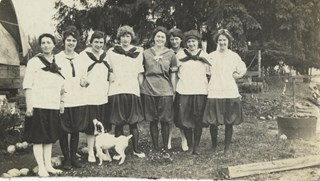 Charlotte Vidal is second from the left and Dorothy Vidal is on the far right. 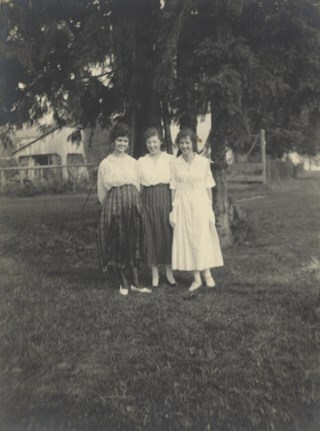 Photograph is a portrait of three women identified from left to right as A Scott, Dorothy Vidal and Charlotte Vidal. 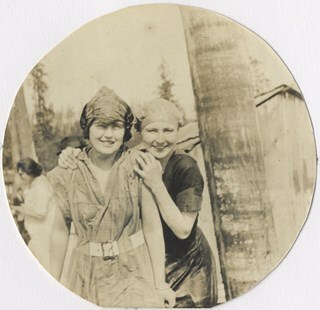 Note in pencil on album page reads: "A Scott, Dora, Charlotte"
Photograph is a portrait of two women identified from left to right as E. Martin and E. Trapp. 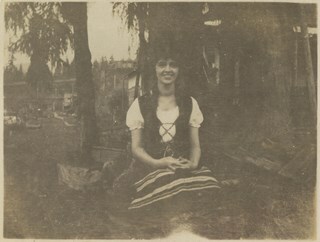 Note in pencil on album page reads: "E Martin, E Trapp"
Photograph is a portrait of Charlotte Vidal in a traditional costume, sitting outdoors. 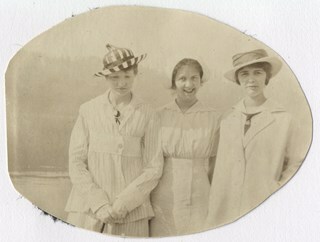 Photograph is a portrait of three women identified from left to right as Charlotte Vidal, unidentified woman, and Dorothy Vidal. 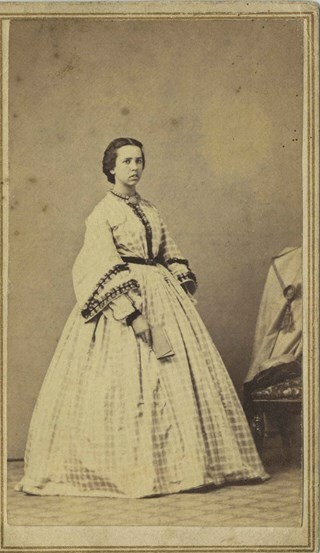 Photograph is a portrait of a woman identified as Charlotte Vidal. 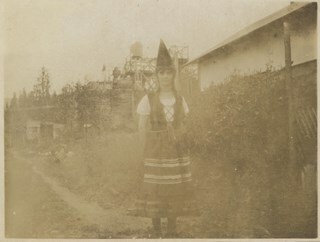 She is wearing a traditional costume and standing outdoors. 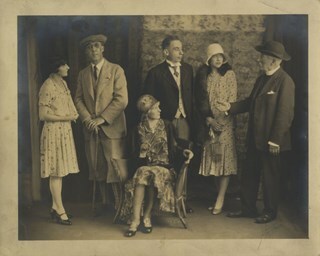 Photograph is a portrait of four women and three unidentified men. The woman on the far left is identified as Winnifred Rowe. The woman in the centre is identified as Charlotte Vidal. 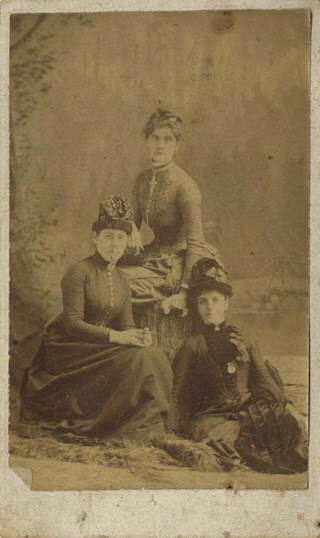 Note in pencil on album page reads: "Charlotte"
Photograph shows three women (the middle one identified as Charlotte Vidal) and three unidentified boys. They are in two boats on a lake and some of them are holding crabs. 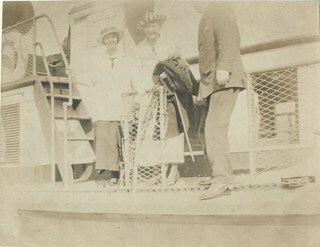 Photograph shows one woman identified as Charlotte Vidal standing behind an unidentified woman and an unidentified man. 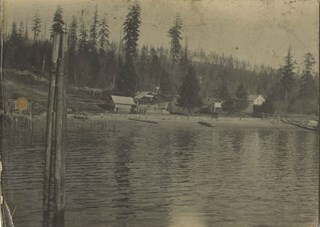 Note in pencil on album page reads: "On the 'SS New Delta' "
Photograph shows the embankment of a body of water lined with houses and trees. Note in pencil on album page reads: "Sunnyside"
Note in pencil on verso reads: "Sunnyside"
Note in pencil on album page photograph reads: "Charlotte / At Capilano / 1918"
Photograph is a portrait of a man identified as Ray Straub pushing a woman identified as Charlotte Vidal in a wheelbarrow. 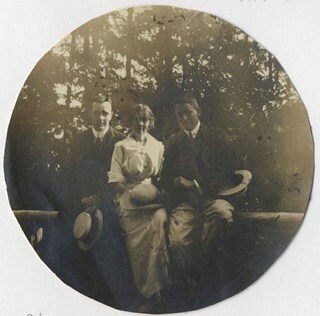 Note in pencil on album page reads: "CV & Ray Straub / At Capilano / 1918"
Photograph is a portrait of a woman identified as Charlotte Vidal flanked by two unidentified men. 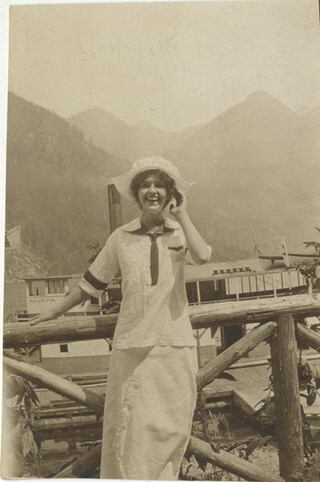 Note in pencil on album page reads: "At Capilano / 1918"